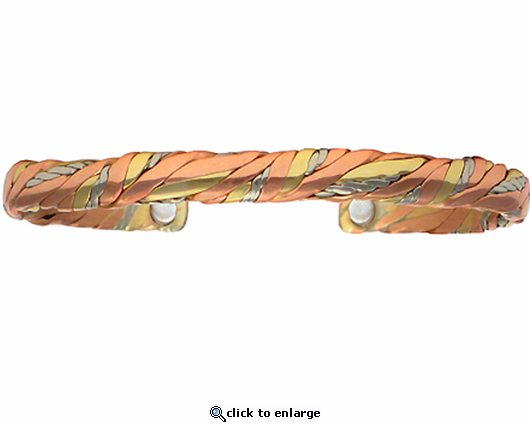 This delicate copper magnetic therapy bracelet which Sergio calls Sweatlodge Brushed is woven how Native Americans weave sage to make a smudge stick that would be used like incense before sacred ceremonies. It is Sergio Lub style 515 and delicate at about 1/4" wide. It is made in the U.S.A.. It has 2 rare earth magnets, and is made of pure copper and other solid metals that are all made from copper. Still waiting for the results of copper healing my arm. The bracelet itself is beautiful. 5 stars. Product met all expectations.